Our two most recent posts have utilized statistics from a Vanderbilt Law Review article in order to compare certain types of Wisconsin Supreme Court rulings with the decisions filed by other state supreme courts. The law review article reached a number of conclusions that seem provocative when measured against Wisconsin’s experience, and this post addresses another such finding. Nationwide, the article observed, publicly-funded lawyers (public defenders and publicly-funded private-bar lawyers taken together) were approximately twice as likely to obtain favorable results in state supreme courts as were private attorneys in cases that met the study’s criteria: no capital cases, no appeals filed by the State rather than by defendants, and no misdemeanors. This post will determine whether the same can be said of Wisconsin. Overall, as is evident in Table 1, the national study’s finding was reversed in Wisconsin. 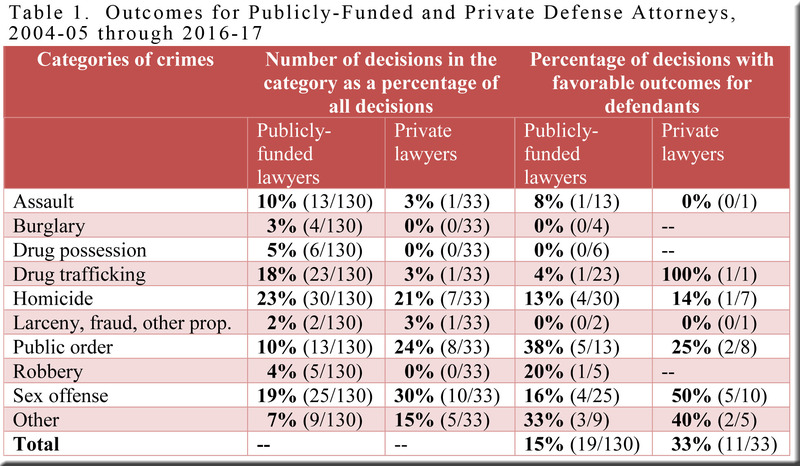 Here, private lawyers fared slightly more than twice as well as publicly-funded lawyers in the types of cases under consideration. Perhaps this owes something to a greater reluctance on the part of private attorneys (and the clients who pay their fees) to pursue cases with scant hope of success—although this factor was clearly not decisive in the law review article’s national figures. Along with demonstrating how dependent petitioners have been on publicly-funded attorneys to reach the supreme court at all, Table 2 has something to offer readers interested in a topic raised by the first post in this series—the change that occurred when Justice Butler (2004-05 through 2007-08) was replaced by Justice Gableman. The success rate plunged most dramatically for publicly-funded lawyers, but private attorneys also found the going considerably tougher after 2008. The two categories of lawyers taken together obtained favorable outcomes in roughly a third of their cases during the “Butler years”—a modest result in light of the national data in the law review article, but an accomplishment that would seem spectacular (and unattainable) thereafter in Wisconsin. The article (“State Criminal Appeals Revealed”) was written by Michael Heise, Nancy J. King, and Nicole Heise. It presents findings from a dataset on criminal appeals resolved in 2010 by state supreme courts and lower appellate courts throughout the nation. See the previous post for a description of the categories of crimes listed in Table 1 and for an explanation of how the authors of the law review article established whether a decision was favorable for the defendant. Three cases had pairs of defendants—one defendant represented by a publicly-funded lawyer and the other defendant represented by another attorney. I included each of these cases in the data for both the publicly-funded and private columns of the tables. It bears repeating that we are considering only felony cases, and only cases in which the defendants were the petitioners.